I haven't done and strata color layers in a while. When I did, I used surface layers with altitude constraints. This is what I came up with. That is insane. We really need a Photoshop like gradient shader. It would be easy to implement. This should be fast since it is all constants. 2 If s is the controlling variable (0..1) and c is the complement, generate all 15 powers of s and c where the sum of powers is 14.
multiply the 15 weigted colors from step 1 by these 15 variables. Add all the 15 results from step 2. Are you sure you're not doing income tax forms? EEErrr.... yeah, just doing that now. How many grams of flour do I mix with the sugar? Since the only artistic gene I have is programming, I attack difficult problems. Attached Efflux perlin stata 11 with his gradient hack (5 colors + 1 color tone modify) replaced by mine 15 color gradient. Also attached is is the 15 color "South West" gradient. So now to the mode diffcult, make a soft gradient with specified non equal input values. I'm not sure exactly what you mean, I may be just misunderstanding your language. You mean like a Macro node? What I think you really need is not a better node system, you need to be able to write functions using a scripting language. We will add scripting support in future (probably via Python). time the function is inserted in a node network. to got to the internal each time you apply this function. Ah yes. That's what we'd call a Macro function node. I have been away so don't know what has been posted recently but I will look through the forum in time. I have moved house and had no internet connection for a while. Also, to tell you the truth I got very frustrated with TG2 when I developed the last planet. I'm working almost exclusively on Linux now for everything except TG2. This includes Mojoworld which works perfectly on TG2. I go through phases of using different apps. Ideas from one feeds into another. I've got lots of time but not sure which direction I'm going in. I'm finding that doing digital painting and working in apps like 3D Coat is getting very fast results. As we know landscape building is anything but fast so I get frustrated with TG2 then abandon it, usually to return later. I'm using too many apps and have to streamline this down. I've spent a week working on node networks in Mojo, probably thousands of nodes in my new Mojo planet. By the time I get back to TG2 I forget what I've done and can't even answer questions about it. Probably I will spend some time in 3D Coat in the near future which doesn't require years of working out how to do things. I'll have a look at that colour gradient later. It looks good. I'm going explain in more detail exactly how you can do things in Mojoworld. I have created a TG2 planet that uses the same processes as Mojoworld but there are tons of ways to use nodes in Mojoworld that is not yet possible in TG2 or at least not easily. Mojoworld will always be different because the data flow is different. There is no vector, scalar and colour differentiation in the data flow, at least to the user. This will always make Mojo slightly easier but still, there is a bunch of things TG2 needs or at least needs to be worked out. There are enough people here who have some understanding about nodes now to see exactly why coming from Mojoworld to TG2 is so frustrating even if you never used Mojoworld. It's impossible to even begin to promote TG2 to a Mojoworld user as being good. You'll see some things that you will want in TG2. Things that wish for threads should be full of. 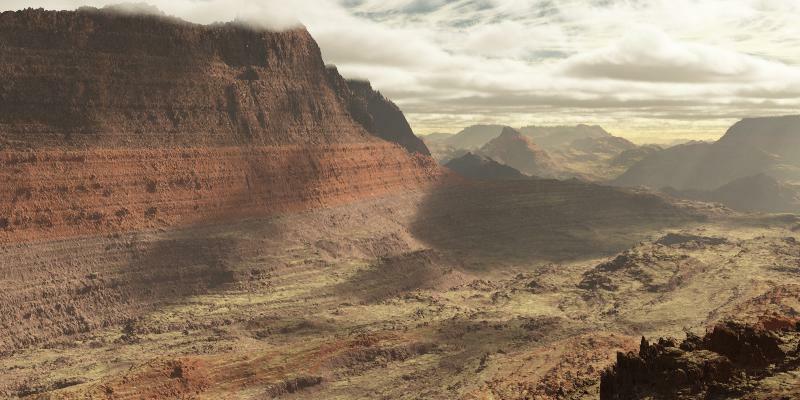 I'm not sure where to put this info, possibly in Terragen 2 discussion. I imagine some people may try to relate ways of doing things to TG2 so it's not really open discussion. I'll have to explain a few basic ideas first about Mojo's nodes which will not be hard but first thing I can describe is completely related to this thread. Here we have struggled with colour gradients and altitude. Piece of cake in Mojoworld. Of course I imagine colour gradient will eventually make an appearance in TG2 so I'll concentrate on altitude. I have a Mojoworld folder already with examples of Altitude driven fractals so it's a good start. I won't go any further here.